This past Monday I had the opportunity to attend a screening for Safe House, starring Denzel Washington and Ryan Reynolds. I didn’t know anything about the film going in, but the fact that Denzel was starring was enough motivation to get me excited. It didn’t take long for the action to start and within moments I found myself clutching my pearls around my neck with my mouth dropped open in shock! For the rest of the film I was perched on the edge of my seat, staring intently at the screen, taking in every moment. It. Is. Amazing! Definitely, a must see! Because I’m not the biggest action-film buff, the plot initially escaped me. After the first few major action scenes someone had to explain to me what was going on. For the sake of sparing anyone the embarrassment of being lost so early in the game as I was, below is a short brief on the background so you have a point of reference for what you will be seeing. 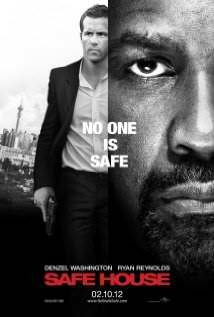 Frost (Denzel), an American citizen, is a bad guy who is wanted on four different continents for breaking the law. He is in South Africa to receive an EXTREMELY important file (look carefully because it’s in the form of a tiny glass vial) from an old homie from his years spent in Europe. Unfortunately for Frost, some other bad guys want the file so they are chasing him. In order to escape, Frost decided to turn himself in to the US Embassy. The US is charging him with espionage and opts to interrogate Frost in South Africa because they can get away with more there than they could if they return him to the US. Frost is transported to a South African Safe House (a regular looking house that has secret chambers and basements for police to do their dirty work) where Weston (Ryan Reynolds) is the housekeeper. When the US begins the interrogation, the Safe House gets attacked! From there Reynolds finds himself in charge of Frost…let the games begin. Yikes! « Guiness Book of World Records Came Callin! You Think I DIDN’T Answer?!?! Well whatevs, I saw it b4 I read this… Great movie, I do agree!